Why theater? : I stumbled into playwriting as an accident and after many years, it just became something I did. Sometimes, it’s pure discipline, because I don’t understand why I keep doing it, except that I’m miserable when I don’t, and unless I keep writing, I feel like something inside me is never let out. I wish there was another way to explain where it comes from, but it comes from a real need, and once a play is written, it just seems logical that I would find a way to make the play happen. The process is long and protracted. It feels like you’re pregnant for four years, and you just carry this thing—this play—and find the ways to make your words human, by finding actors who’ll embody your words; then, you create a home for them, by finding designers who can make this “play-world” you’ve written come to life; and then, you figure out why you’re putting all of this together, and for whom, and how you’ll make it happen, so you can find an audience. Tell us about TALA: TALA tells two stories—the first is a semi-autobiographical narrative about my immigration story as a gay, Korean-Chilean playwright (performed by Daniel K. Isaac)—and the second story is the story of Pepe and Lupe, two lovers inspired by Chilean poets Gabriela Mistral and Pablo Neruda (performed by Flor De Liz Perez and Rafael Benoit). We collage these two stories together and thread them into a whole with original music by Svetlana Maras, choreography by Yin Yue, illuminated props by Jason Krugman, live video by John Knowles, in a theatrical production with set design by Marie Yokoyama, lights by Chuan-Chi Chan, sound by Lawrence Schober (and Chris Barlow) and costumes by Elizabeth Barrett Groth. The overall effect is seriously playful, challenging, and beautiful—everyone involved is an active collaborator and doing really fascinating work. What inspired you to write TALA? : I started writing TALA four years ago because I was trying to find a way to immigrate to the United States. 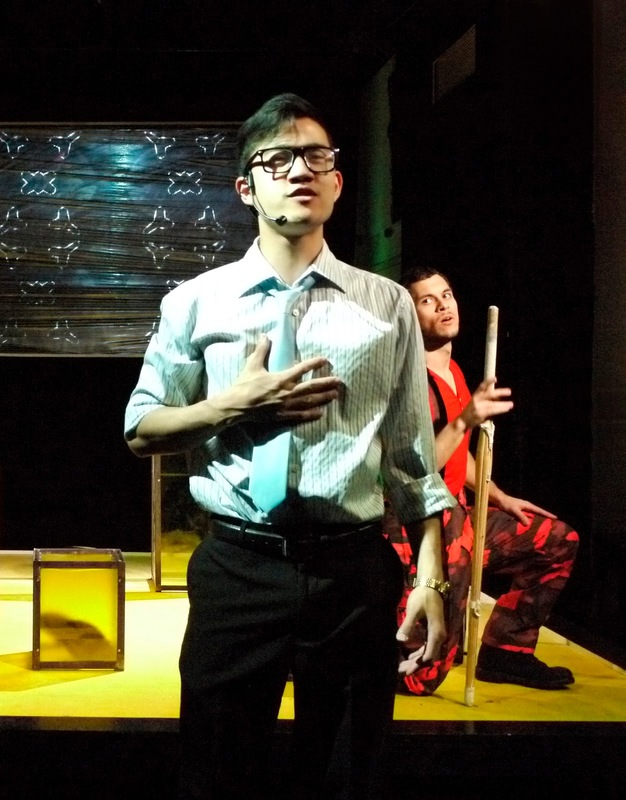 Obviously, you can’t immigrate to a country by writing a play, but I wrote the play as a way to expressively work through what I had to figure out legally, as an immigrant. When I was finding my way through the immigration system, the play did well, but when I lost my way, the show stopped. I got my Greencard this May and we received our artistic residency at the University Settlement a few weeks later. Soon after that, we scheduled the premiere of TALA and I’m quite excited that we’re doing it in this historic, NYC landmark that has served immigrant communities for over 130 years. I’m very thankful Alison Fleminger and Lisa Clair (Curator and Co-Curator of the Performance Project @ University Settlement) have invited us to tell this story in their space—it’s a heavenly match. What kind of theater speaks to you? What or who inspires you as an artist? : I am inspired by the theater made downtown—although “downtown,” “experimental,” or “performance art” doesn’t really capture the nature of this work. I am inspired by theater that challenges conventions, manipulates forms and techniques, and I respond very well to work that is personal and made by individuals—when you feel like someone is really reaching out to you to tell you something. I don’t go to the theater to be entertained, I like going to the theater to listen, to think, and to be asked to think about things in a different way. That really inspires me. If you could work with anyone you’ve yet to work with, who would it be? : I feel like I’ve worked with everyone I wanted to work with as I prepared myself to make this show. Previous to my studies at Columbia, I was an exchange fellow in Augusto Boal’s Center for the Theater of the Oppressed in Rio de Janeiro and learned how to create work based on collaboration and improvisation. I searched for ways to make this happen with my own writing, and I interned with Young Jean Lee’s Theater Company for two years, before jumping on the Mabou Mines’ band-wagon to work with my mentor, Lee Breuer, for another two years. Last year, I was a fellow with Target Margin Theater’s inaugural Institute for Collaborative Theater-Making and found ways to process and distill all of these practical experiences into a method I can call my own, and now I’m more interested in making my own work. I have more than five plays in different stages of development, waiting for me to make them happen, so if anything, I’d like to work with theater companies that can help me keep making my work, or tour my work to support the making of future projects. Now that I am not restricted by my immigration status, there’s this door that’s been opened and I’m just trying to stay centered as the ideas flow out. What show have you recommended to your friends? : Since it’s January and festival season, I am recommending multiple shows to my friends. I’m excited about The Assembly’s That Poor Dream at The Tank, Temporary Distortion’s My Voice Has an Echo In It at the COIL Festival, Bora Yoon’s Sunken Cathedral at HERE’s Prototype Festival, Cynthia Hopkins’ A Living Documentary at American Realness, Lucy Alibar’s Throw Me on the Burnpile and Light Me Up at Under the Radar, and La MaMa’s SQUIRTS!, curated by Dan Fishback. I’m sure I’m not the only one excited that all 10 seasons of “Friends” are now available on Netflix, but if you’re a theater person and not going out to the theater every night this month, you are really missing out on some of the best theater in the city. It’s just that plain and simple. Who would play you in a movie about yourself and what would it be called? : I am in love with this question because I’ve already written this movie. It’s called "SEOUL BABY" and it’s a gay drama set in Korea. Daniel K. Isaac would play me, as he’s already done so in disOriented, an immigrant family drama with Korean fan dancing, and will be doing again, in TALA. Daniel K. Isaac is my muse and we have a really wonderful, collaborative partnership. We challenge each other to grow artistically with each project that we work on, and I hope we get to keep working together in the future. He’s a generous artist and phenomenal actor, and the way we’ve managed to keep collaborating over the past few years truly excites me. If you could go back in time and see any play or musical you missed,what would it be? : I really wish I had seen more productions of Sarah Kane, Martin Crimp and Caryl Churchill, more work by Richard Foreman, and I always missed Dimitris Papaioannou when his work was somewhere in the States. I have a feeling that I would appreciate their work even more if I had had a more direct, visceral experience with them, so I’d go back in time to see their works. What’s your biggest guilty pleasure? : I am obsessed with "Project Runway". I think there’s something really satisfying about watching all these people make clothes and “put on a show” in sixty minutes and see the [very reduced and edited] creative process that makes that happen. By the end of each episode, it makes me feel a sense of creative completion, which is nice, because my process is so glacial. It takes so much time. Theater is probably one of the slowest and most complicated ways of expressing yourself creatively, but the collaborative practice and social nature of theater is my ultimate guilty pleasure—it’s like an addiction. I am hooked on people. If you weren’t working in theater, you would be _____? : I would probably find ways to work in film or TV, because you can reach more people through these other media. But to be honest, I already work outside the theater to support the work I do artistically, so in some ideal future, in which artists are more sensibly compensated for their work, I would probably love being a full-time artist. What’s up next? : I have readings and workshops lined-up for the Spring following the premiere of TALA, on-going discussions about a TV show, and I’m looking forward to spending lots of time writing grants so we can produce our next show!